Pete Seeger’s companion for over seven decades, his banjo, read ‘this machine surrounds hate, and forces it to surrender’. Today’s world has a handful of living legends. This morning, it became one less; we lost Seeger, at an age of 94. His sing along tunes, revived and scraped from folk tunes, strung with simple words were a tradition in itself. Born in 1919, Pete Seeger has had a musical journey spanning across a century. He saw wars, workers’ movements, fight for civil liberties. But he was not a mere spectator. He wrote songs, sang tunes and documented the history of struggles. His songs are a companion to anyone who wants to revisit the history of the struggles waged for peace, freedom and justice in the twenty first century. He was not only a song writer, or a folk musician, he was an activist; a political activist. His music was his politics. Beginning from his student days, when he became a member of the Young Communist League and started singing in favour of the worker’s unions, he has always been a man of the ‘collective’. As he added to one of his most famous renditions, ‘We shall overcome’, the lines, ‘We will walk hand in hand’. The song has now almost become an anthem for all struggling people, which has been translated in innumerable languages worldwide. He believed in simplicity and that which made a song a people’s song. Describing the song, he said, “It’s the genius of simplicity. Any damn fool can get complicated”. He was a member of the Communist Party, which he left in 1950, but called himself a communist till the end. He took up the cause of peace. During the Cold War years, he was an ardent advocator of building peace. He campaigned for Progressive Party candidate, Henry Wallace, who stood for peaceful US-Soviet negotiations. In the McCarthy era, he had to bear the brunt of his slogans for peace. He was even sent to prison for a year in 1961 and was ostracized, on grounds of contempt of Congress. However, all this never failed him to stand up for the ideals that he lived up to till the end. He believed in a peaceful world, free from wars. During the Vietnam War, when peace activists were rallying on the streets, Seeger wrote, ‘Where have all the flowers gone?’, depicting the tragedy of wars. His greatest dream was perhaps, the words he adapted from Ed Mc Curdy, ‘I dreamed the world had all agreed to put an end to war’. He was highly critical of the US war on Iraq and protested with his songs demanding a pull out of American forces. Seeger has been called the ‘conscience’ of the American people. He was a conscience of all people of the world. He was a nationalist in the sense that he imagined his homeland to be a land for all free and equal, as he wrote and sang, ‘Woodland and grassland and river shoreline, To everything living, even little microbes, Fin, fur, and feather, we're all here together, This land was made for you and me’. Pete Seeger never averted from taking a stand against the establishment. He had a youthful charm, which made him a ‘universal singer’. Who would have expected the ninety year old singer to be part of a protest? But Seeger was no other, cheering and encapturing the imagination of the protesters thronged at the heart of New York, in the Occupy Wall Street protests. Pete Seeger once said that protest songs and songs of freedom, will ‘reaffirm your faith in the future of mankind’. 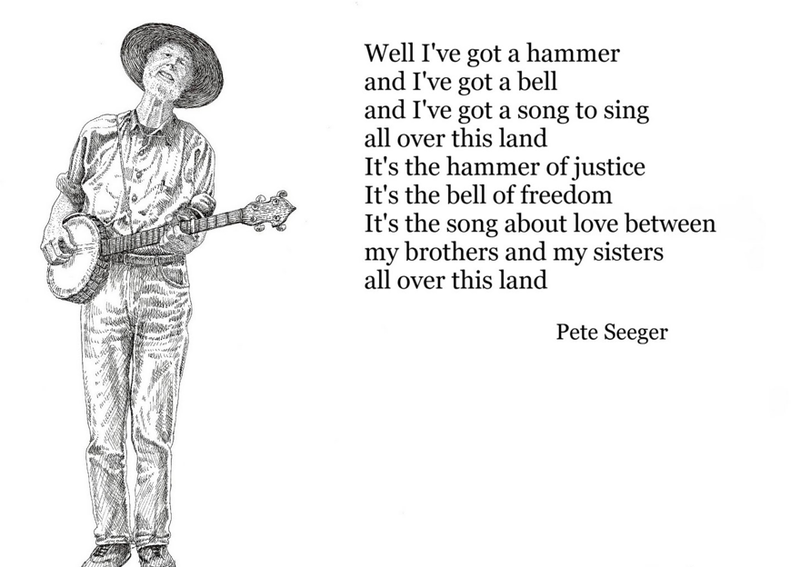 Pete Seeger will remain an inspiration for generations to come. He will always be, as someone said, the ‘voice of our protests’. 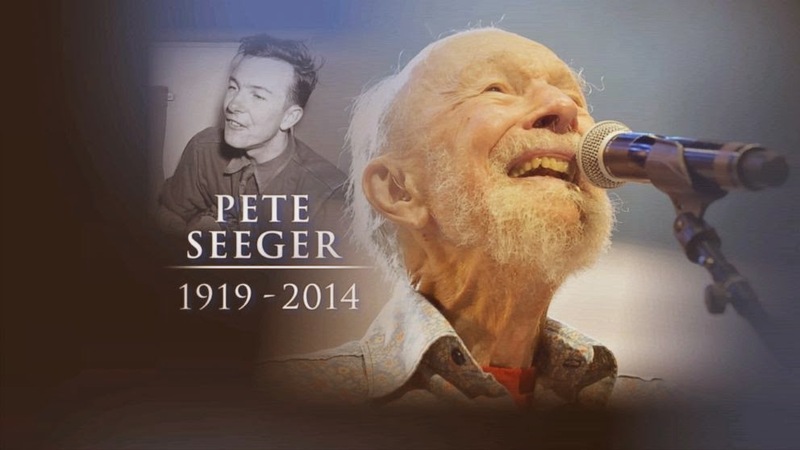 As Seeger himself wrote that there is a ‘A time to build up, a time to break down, A time to dance, A time to mourn, A time to cast away stones, A time to gather stones’, we shed a tear at the passing of a legendary voice and man, and also gather inspiration from the work and times of Pete Seeger.